Every aspect in interiors plays a vital role in augmenting the charm of a room. Talking about the bedroom, it stands to one of the most relaxing places in a house and ne wants it to be stylistically designed. Though, job of interior designer is to use the available space wisely this can be carried out with the placement of designer furniture, artistically crafted bed and an almirah adding to the glory of the room. Apart from all this, bed sheet is something that boosts the overall charm of the room. It is like adding four stars to the overall appeal. Each individual has his own choice, when it comes to the matter of buying bed sheets. First of all, opting for the soft material of bed sheet is highly important. It is because no one wants that bed sheet may itch like a porcupine at the time of sound sleep. So, one should opt for glaze cotton bed sheets. Secondly, such types of bed sheets have long lasting prints that do not fade away with several washes. And these days, it is the trend of digital prints that look simply spectacular. One of the most favored choices in digitally printed bed sheets is the floral design. Be it small flowers or the bug tulips, they look stunning and have vibrant shades too. In fact, many of them have contrast colored floral prints that attracts onlookers easily. And when they are spread on the bed, the lustrous beauty of the room comes out flamboyantly. Another famous print spreading digital sparkle on the bed sheets are intricate folklore with tiny floral patterns. Well, the entire bed sheet looks like a cloth full of beautiful designs. Definitely, it adds a royal touch to the bedroom too. Obviously, everyone wants that people visiting their home should appreciate the linens used in bedroom. This is the reason that digital prints are gaining popularity over geometrical or traditional patterns. It is always said that the background shade of the bed sheets should be in liaison with one of the shades present on the walls or furnishings. It will give a wholesome effect to the interiors. 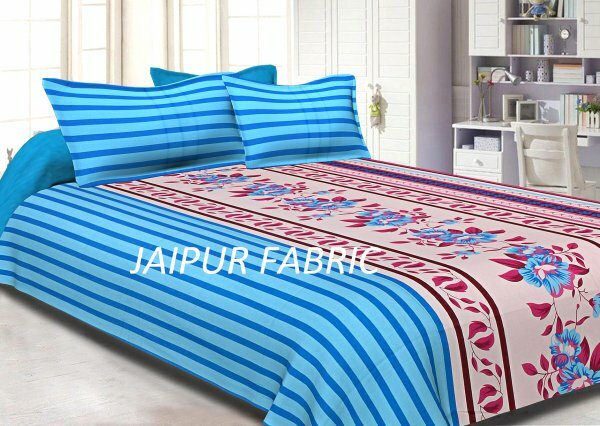 In the matter of buying digitally printed bed sheets, one can check out different websites or online handloom stores. They have an extensive variety of bed sheets available at separate rates. Depending on the design printed and intricacy level, the cost of the bed sheets are set. The best part of checking the designs online is that a person tends to save on time that might get wasted in hunting the most suitable one for the room. Of course, buying online always comes with some or the other benefit. This may also include some or the other types of discounts offered on the bed sheets. It will allow the buyer to enjoy reduced rates as compared to the ones available in retail outlets. Lastly, one can check out several prints at a single click, which is not possible at the physical handloom stores as they might have limited stock or digital prints.